← Is your internet marketing strategy headed for trouble? While shoppers love those Midnight Specials, and fight to get through the doors of the big box stores for the lowest price electronics and kitchen gadgets, appliance purchases can be another matter. Here are three reasons why both buyers and sellers need to think about avoiding Black Friday like the black plague. 1. Most items sold on Black Friday are NOT sold at their lowest price. The Huffington Post reports, “Data from consumer-price research firm Decide Inc. shows that many of the holiday’s most popular gifts — ranging from flat-screened TVs to stuffed animals — are not sold at their lowest price on Black Friday. In fact, many items are cheaper at other times during the year.” This holds true for appliances as well. Except for loss leader advertised specials, don't expect knock your socks off appliance prices on Black Friday. Appliances have fairly low margins for dealers to begin with so realistically, huge percentage across the board discounts aren't going to occur. So black Friday appliance shoppers are likely to be disappointed with the deals, and dealers will likely be spinning their wheels trying to win them over. 2. Purchasing “Door Buster” sale items are often not a good deal for either the buyer or the seller. 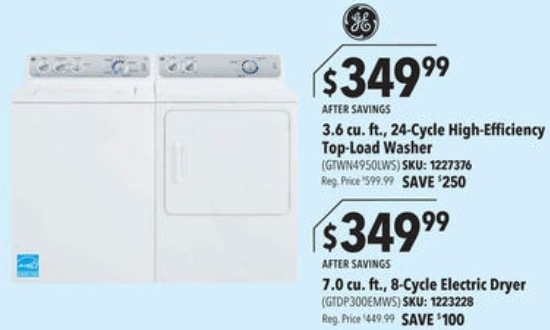 Lowes and Home Depot seem to compete for the lowest Black Friday price on an entry level washer and dryer. Look for a pair at $599 or $699. How well these low end models will do at washing and drying a variety of clothes types and load sizes is questionable. It turns out that though these are truly no profit loss leaders for the seller, the buyers may wind up losing too. 3. Appliance retailers report that Black Friday does not produce particularly high sales volume. And for those who do promote heavily to get traffic on Black Friday, the cost/benefit ratio is not good. Here are two typical comments taken from a well known appliance retailer blog. So appliance shoppers might think twice about spending their precious Black Friday shopping hours looking for barn burner appliance prices. Similarly, appliance sellers might think of closing on Black Friday so that their employees and their customers can focus their efforts on purchasing toys and other holiday gifts. This entry was posted in Appliances and tagged advertising, Black Friday, Home Depot, Lowes, retail, sales. Bookmark the permalink. 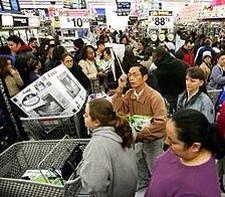 This was to be my first black friday… at least I understand things a little better now. Thank you. Though I did work at best buy, I know how much appliances COULD go for, but never will.